These are really quick and a great way to use some of that leftover Christmas ham. The mushrooms need to be stuffed a few hours ahead of time so the filling can set in the refrigerator for three hours. Whip cream cheese with a mixer until creamy. Mince enough mushroom stems to make half a cup. Fry mushrooms in olive oil until they begin to lose water, then add spinach and ham and cook until spinach wilts. Mix with cream cheese and add sherry. Season with salt and pepper, then spoon the filling into the mushroom caps on a baking tray. Refrigerate for three hours then bake in an oven at 350 degrees until mushrooms are cooked, about 15 minutes. This entry was posted in Appetizers, Food, Recipes and tagged entertaining, ham, mushrooms, quick, spinach. Bookmark the permalink. We just finished some stuffed mushrooms. These would be a great use for our leftover ham though! We may just have to make them again. Interesting variety of flavors here … salt, greens, cream, earth … hmmmm … pinot noir? That would be great. We actually had them while tasting cabs with some friends! Wow, I bet these taste great! Nice photo! Looks great Ill be making these tomorrow night.I have some Jarlsberg cheese left over I was thinking it would be nice grated over the top. Great idea! I’ve ordered a honey baked ham for a New Year’s party I’m co-hosting, so this recipe will be great for the leftovers. Can you use frozen spinach or do you use fresh? I used fresh. If you use frozen, use less, like maybe 3/4 of a cup. And remember to cook it a bit longer to get all the water out. Yes, pinot noir. Yes indeed, stuffed mushrooms like this! Delicious… just keep these appetizer recipes coming. Your baked brie was such a hit, I can’t wait to try this one! We just had some Wegman’s stuffed mushrooms on Christmas eve. Oddly, it never occurred to me to make them ourselves. These look so much better. These look great…Mmmmm, fungus and cheese! My brother had an enormous Christmas ham and now I wish I had taken some leftovers! I like the combo of the ham, spinach and cream cheese; great little appetizer! I’m gping to try them on Saturday when we host my best friend from University for brunch. Ooh – lovely! We have just bought a mushroom growing box to go along with our oyster mushroom growing so will try this once we have our first “crop”! Very nice – Ritchey would love these! These would be perfect for a party. I bet they go really quickly. Can I pop that entire plate into my mouth? Because I probably would. Great use of leftovers. I won’t triple dog dare you I know you could! I could go for these right now. Mushrooms, cream cheese and ham so yummy! The special pancakes won’t go up until next week, but we promise you will like them. We’re always behind, or is it ahead?, on posts. Great way to use up leftovers. I love stuffed mushrooms. Yummm! They look amazing and, like many leftover dishes, they have nothing to be ashamed of (on the other hand your ham looked like a masterpiece). Okay, I think I need to test out my mushroom allergy on this..it looks too good not to try! I love the ham and spinach mix, kinda salty, creamy. 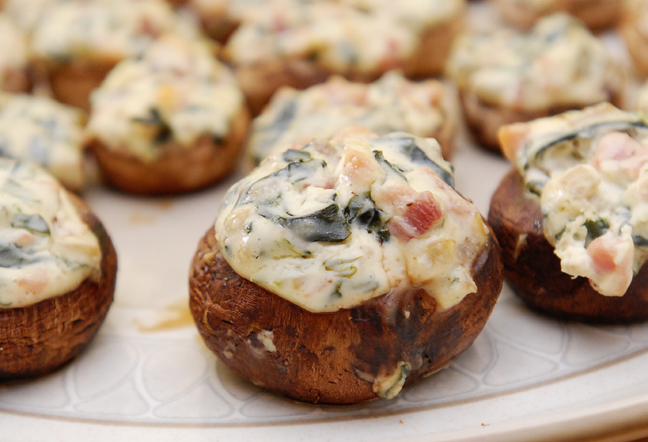 I know everyone loves stuffed mushrooms at a party and this mix will really wow them!! I am sending this recipe to my mom – she would absolutely love it! Just came home from the holiday with extra ham…thanks for the New Year’s Eve inspiration! OK, so maybe the biscuits and these…and maybe the hot nog…you just give me too many choices. Can I move in? As long as you like dogs! How sad…no leftover ham in my house do to Liz’s dislike the porky product. These look like a great NYE appetizer! Huge thank you for sharing this recipe! Thanks, for the link love. Glad you liked them.